A ROW OF DOLLS DISPLAY THE VARIETY OF TRADITIONAL CLOTHING WORN IN PAKISTAN AT A SHOP OUTSIDE THE RAFIPEER CULTURAL CENTER IN LAHORE. PHOTO BY BEENISH AHMED. “They broke one gate and came in," a student who was injured when Taliban gunmen stormed into his Peshawar, Pakistan school just over one year ago said from his hospital bed. "All of the kids laid down. In the hall there are a lot chairs and they came to every chair and shot us." More than 150 were killed in the attack, most of them children. Considered one of the darkest days in the history of a country which has been bloodied by terrorist extremists, ruthless secularists, belligerent nationalists -- and uncompromising sexists who would rather kill their own daughters than see their reputations besmirched. But rarely is sexism considered to be a menace akin to that of sectarianism. It's even rarer that the omission of the country's most marginalized from their place within classrooms and within textbooks is called into question. 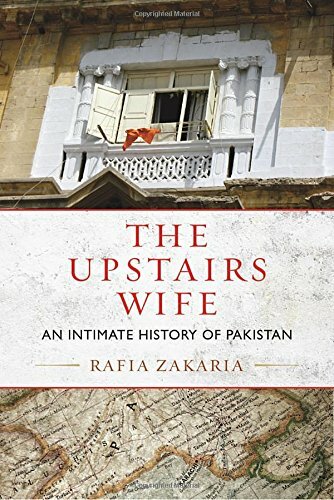 In her book, The Upstairs Wife: An Intimate History of Pakistan, Rafia Zakaria does both. A Pakistani activist, writer, and columnist, she weaves her country's history with her family's history in order to explore the ramifications of political acts on personal lives. She spoke about her elegant, literary approach to history in a phone conversation with Beenish Ahmed, editor of THE ALIGNIST. Their conversation, which has been edited for length and clarity, is below. 1. This book captures intimate details of your family history and equally intimate -- and often overlooked -- details of the history of Pakistan. What made you decide to bring the two together? I think, for me, the biggest -- and I'm sure a lot of authors are the same way -- motivation was, first of all, of course, a curiosity for what has existed before I existed. There's this question of, what was Karachi, what was here before I was here? And that was a question that particularly was important to me, because I grew up often hearing that, "Oh, Karachi has no history." And what was meant by that was the fact that this is a recently battle post-Partition city. As opposed to other cities in Pakistan, all around the world, cities like Lahore, who had a Mughal legacy, who had this story, and often a very romantic story, tied to their present. Karachi, of course, is a very gritty, intense city. It is, however, a city that has just sort of burst through the seams, over the past several decades. It was a mix of both of these curiosities, one about my own family's past and how we ended up there in Karachi, and then the question of what was here before, the question of whether you can take a community from one place and plant it in another place, and what that looks like [when it does happen]. I think Karachi, for me, at least, is a living experiment, into the tenability of recreating community after a mass migration. And I think that its success or its failure, its losses, its problems, all reflect the central question. And also, I guess on a very basic level, I grew up not having a lot of reflection, literary reflection, narrative reflections, of the city that was around me, or the life that my family lived. There were either expectations of Pakistan, or Karachi, that were purely historical, or there were sort of discussions that were purely personal, that do exist in the Pakistani public sphere. As someone who loved and loves Karachi, I wanted a narrative that reflected a reality that I felt was missing from writing. After the blasts came the fire. Within minutes it coursed through one, then two, and then three buildings, hungry flames melting flesh and bringing down structures with impossible speed and ferocity. One building housed a restaurant, where minutes earlier women and children has been enjoying chilled sodas and plates of hot samosas. Within seconds they were all consumed by fire, along with dozens of vendors and their wooden carts of fragrant mangoes. Their sweetness, which on ordinary days could cover up so many varieties of unpleasant odors, failed to cover the stench of death. The morning paper reported the details of the Bohri Bazaar blasts, the first of their kind in Karachi, now a city of eight million. One shop destroyed in the fires after the explosion was Liberty Uniforms. We read the news sitting around the same kitchen table where a few days ago my mother and grandmother had settled on a date for uniform shopping. It was Tuesday, the day we had planned to go. 2. What did it take to capture that? Did you sit down with relatives and friends and neighbors and talk to them about what existed before you existed, as you said? Did you turn to the history books as well? What went into making this book, the beautiful mash-up of personal narrative and historical narrative that it is? I think one of the sort of philosophical beliefs that I have, as a feminist and as a Pakistani Muslim woman, is that often that people who are at the margins, or who are given the least attention by society, or a culture, have the most to say about what it's like to be part of it. I think for me, definitely in our family, my aunt is very much at the margins. So I said, okay, I'm going to write about this, what possibly could be interesting about this? That of course is one of the themes of the book: the process of marginalization. Those tenants that we take as central -- family, child-bearing, love -- can become very constricting in certain circumstances. That was one of the ideas. The other was just to kind of look into the past and create a feminist history. I've been, at least, very frustrated by -- most books relating to Muslim women, or Pakistani, or generally women from the global south, have this very prescribed arc. It's like, [they] experience something, and then [they] rebel, and then [they] throw everything off, and that's [the] arc of liberation. I wanted very much to explore what I call and consider the “feminism of resilience.” Which I think is, at least, my legacy. I wanted a reflection of that. I wanted to show that rebellion and resilience have equal value in terms of empowerment. We need both, women need both to express themselves, empower themselves, and to have the freedom to realize their potential. [...] I envision the book as an act both of rebellion and resilience. [I tried] to get the stories of as many women as I possibly could, to show just how complex this tapestry of female life in Pakistan is. But then, it's an act of rebellion in the fact that [because it takes] the story of Pakistan and of the country and tells it through the lives of women, who often, [although] not always, [are] marginalized women, or women who were killed or pushed to the sidelines. I wanted to show how you can do that through the narrative [form] because I feel that feminists of color, Muslim feminists, feminists from the global south, struggle with that because we are sort of indoctrinated into a very singular idea of feminism being exclusively a feminism of rebellion, which, in its essence, kind of alienates us from our own legacy [because our feminist traditions] more solidly draw on resilience, and grace, and strength in our forebears. I wanted to bring that into the conversation. A COUPLE LOOKS AT ITEMS FOR SALE IN A CURIO SHOP IN ISLAMABAD, PAKISTAN. PHOTO BY BEENISH AHMED. 3. You use the word “marginalized” but it seems to me that many of these stories were overtly omitted from the history books of Pakistan. From figures including the wife of Pakistan’s founder Mohammad Ali Jinnah to a group of elite women who rallied against the a law allowing for polygamy in the country. To me, it seems that omission is a big part of constructing national narratives, no matter which country we're dealing with. In your opinion, how has what's been left out of shaping Pakistani history impacted the country as it is today? I think it's a terrible omission, because the consequence of a history that is entirely constructed by men, and entirely constructed on political parameters, is that the emotional landscape of the country is left undiscussed and undebated. Those are precisely the kind of things that I wanted to mix up. You can have a number of laws or rules, you can get them from religious texts, you can get them from legislation, but the fact is that until we see a picture of what law or politics does to an ordinary family, you can't really weigh [its merits or failings]. I wanted to bring this idea of emotional objectives into the conversation. So you have a man who's got two wives, and the Quranic description [of polygamy calls for a husband to exercise] "perfect justice” [amongst each of his wives]. I wanted to show how of bad, [and] in a way pathetic, this attempt at perfect justice is [when its lived out in actuality]. I think unless you take these rules or legislation or political events and see the impression they leave on ordinary people, you cannot evaluate them for their justice. You can go scream from here to forever that "This is allowed by law," or "This is allowed by religious doctrine," but when you see the impression of that on a life, is when you have to confront its emotional cost. I think literature -- and this book was at least my attempt at a literary narrative -- can do that. I think that that's its goal, particularly in societies like Pakistan where so many of the ideas are in conflict. The discourse has been reduced to, "Well, it says so here," or "It says so there," and that's the end of the discussion and there's no real evaluation of it in terms of what it does to people. The other thing that I think I really worried about, and I still do, in terms of Pakistan, is from the perspective of the men. This book also tried to challenge Pakistani women and their assumption that there is this very discernible boundary between the private sphere, in which they live and with which they're often more concerned, and this public and political sphere. I wanted to show how artificial that boundary is, and how much of what happens outside the home affects what happens inside the home. In this case, of course, there was an attempt to ban polygamy in Pakistan, and it ended up becoming a legislative attempt to limit its proliferation and to ensure that the women's rights were respected. But of course, as far as most women were concerned, that remained a very elite-level discussion, that only women who were rich enough and politically powerful enough, or associated with one or another politicians, were able to engage in. Which of course then poses the question of, where are ordinary women in this? What was the fault there, in terms of popularizing these ideas and these questions? I'm hoping that girls and women who read this, especially Pakistani and Muslim, are going to consider that. Going to consider this sort of withdrawal into the private as terribly detrimental to their future. The visits were only one portion of Aunt Amina’s divided life. The arrangement when one man had to be shared by two women was methodical, inspired by the Quranic prescription that asked every man taking more than one woman to do so only if he could do “perfect justice” between them. In the case of Aunt Amina and Uncle Sohail it meant his time was divided into blocks of single weeks, which belonged to one and then to the other wife. On one Saturday afternoon, he accompanies Aunt Amina to visit her parents, on the following Saturday afternoon, he accompanied his new wife to her parents. And so it was, every Eid and every deed, every birthday and every breath was thus divided to accomplish the perfect justice recommended by the Holy Quran. 4. How is it that Pakistan has been able to create these mythic figures or mythic ideas through omission and through rewriting history? What has that process been like? When you write an inquiry and that sort of investigation of the ambiguities of people's lives, or the emotional consequences of decisions that they make, give us a more human picture of the world. I think that [there are] consequences of these omissions that you talk about, [down to] the story of Ruttie Jinnah who, even though I was born and raised and lived in Pakistan, I never encountered until I was writing this book. And as the book discusses, there's so many like that. The consequence of [those omissions] is a dehumanized idea of ourselves. I know that there is definitely a lot of blame to be placed within the contemporary discussions, and [academic or journalistic] work on Pakistan that's centered almost exclusively on terror and security and bombs and all of that. Then, some of the fault belongs with Pakistan itself because there's been so much investment in the construction of this history so that it will substantiate one or another political narrative. What happens with that is that when the public narrative is so dehumanized and politically manipulative, personal narratives become the same way because you don't see the figures in the public sphere grappling with issues that you face in your life. What happens because of that is that is individual people, people who should be getting an education, in terms of cultural, social life, especially young people, have no context within which to consider the challenges that they face. If you can't believe in a leader unless they're dehumanized, you can't believe in yourself unless you're dehumanized. You don't own the emotional complexities of your life. There is no discussion of tensions within family, there is no discussion of questions between brothers and sisters or husbands and wives, and that leads to, what I see at least, as a mute private sphere: people don't have a language in which they can talk to each other about these complexities. It was not the censures of others that did them in, but perhaps the difficulty of making a life together in times too tumultuous for the ordinary rituals of intimacy. At first it was just as it should be. She moved in and changed the decor of his dour bachelor quarters. He tried to be home earlier and to indulge her little whims. But before long he was taken by the demands of leadership, by the drama of driving out the British colonialists, by concerns larger than the world of two she wished to inhabit. The bloom on the new Maryam began to fade and with it the marriage began to wither. The birth of a child could not save it; Pakistan and Ruttie both seemed to want all of Mohammad Ali Jinnah, and perhaps Mohammad Ali Jinnah believed that Ruttie would still be there after he had won Pakistan. Mohammad Ali Jinnah had gained a country but lost his love. He was buried in the center of Karachi, and over his grave a pristine white mausoleum of marble was built. Its unblemished dome could be seen far and wide. Mohammad Ali Jinnah came to Pakistan to die, and in death, he belonged to Pakistan. The children of Pakistan learned a lot about him, about his education, his political acumen, his strategic prowess; but we never ever learned about his (non-Muslim) wife, about the woman he had loved. 5. You start the book with the story of your uncle who fell ill, was hospitalized, on the same day that Benazir Bhutto, the former prime minster of Pakistan, was shot. Is that right? I was just trying to reference [how], in some ways, both of them suffered, or inflicted romantic betrayals on the people around them. I think the reason that [their stories were] crucial, was that a lot of the book is this meditation on this idea of freedom and danger. In kind of paralleling, especially Benazir Bhutto's live to my aunt's life, what I'm trying to consider is this idea of who has freedom, and who can use freedom. Benazir Bhutto, the Prime Minister of Pakistan, speaks to the press upon her arrival for a state visit at Andrews Air Force Base. photo by gerald b, johnson via wikimedia commons. On that day, the question was, okay, here's a woman who knew she was at a huge risk in terms of a threat to her life, but then she chose to be in public anyway. But at the same time, Benazir did not flout the cultural expectations of her. She married traditionally, had an arranged marriage, and all of that. With my aunt, here was someone who had a very tense and complicated relationship with her husband [who took a second wife without her permission but] there we were just desperately hoping that she wouldn't be a widow. For me, both of those events show the contradictions in women's lives. The contradiction between what you feel and what you have to do -- and what that says about the world around you. The other part, of course, was the sense of disappointment. Benazir Bhutto, for all sort of the political complexities of her time as prime minister, was someone who was a woman in the public sphere. In being so, she just by definition represented an anomaly. Of course, then, she had been killed. With my aunt and her husband, the reason the disappointment was focused on the fact that they were nearing the ends of their lives, or the later part of their lives, but her life was still entirely determined by the fact that she needed to continue to be a wife to this man, because so much of her identity was wrapped up in that, her social and cultural identity was wrapped up in that. I think it's an exploration of both [agency and dependency]. As an author, I’ve always been, and I am still very frustrated by very singular representations of Pakistani women, as either all oppressed, or all liberated, or all needing an education. All these sort of paths, taglines, that are attached to them. I wanted to give people an understanding of the complexity of life in Pakistan, and particularly Pakistani women's lives. I don't think anyone can read this book and then continue to ascribe [Pakistani women with] these soundbites about, "Oh, well, they all just need an education," or they all just need this, or that. My aunt is educated, Benazir was educated, education is undoubtedly crucial, but there's a lot more than that. Just like [how] you can't say "All American women need free childcare," and that's going to solve all the problems that American women face. I feel a real lack of that, I feel like people don't see that, those sort of rifts and valleys, and that kind of topography of Pakistan, and particularly Pakistani women's lives. 6. How did your family react to this book? Have they read it? Well, not everybody has read it. Some of them have read parts of it. Some are very, very, extremely supportive. My mother especially was extremely supportive of this book. And that's played a huge part for me to be able to write it. I told her that I often felt, and she [agreed], that [by circumscribing] the lives of women entirely in the private sphere, who don't write, who are not engaging in a very visible way, are considered lacking in any lesson for the rest of us. It's assumed that just because they live private lives that are devoted to maintaining families and relationships, that there isn't as much value in them. I wanted to reclaim that value and show how all of that contributes to the creation of women, and how marriage is, in itself, sort of politically imbued. The challenge of course is, like I said at the beginning, people are now schooled to want a...black-and-white narrative. They either want a book that denounces Islam, or the Pakistani or Muslim culture, or they want a narrative that conversely anoints and elevates culture and religion. I wanted to show that both of those perspectives, for me, are wrong. There is no one culprit, there is no one law that can be changed, there is no one thing that can enable transformation on either end. It does take some obstinacy and pushiness, and hopefully a cooperative and collaborative editorial team to be able to tell that sort of story. How that directly reflects the complexity, or that isn't taking sides. Are you going to be with the Muslims, or are you going to be with the [inaudible 00:30:56] of the world? I wanted to show that that is an unfair question. I also wanted to show Muslim Pakistani girls that they can sort of investigate both of those truths, and it's possible to do that in a narrative, and it's possible to be ambivalent and exploratory and let people who read it come to their own conclusion. STUDENTS LISTEN AND REPEAT AS THEIR TEACHER READS ALOUD FROM A TEXTBOOK AT A SCHOOL OUTSIDE OF FAISALABAD, PAKISTAN. PHOTO BY BEENISH AHMED. 7. And I'm sure that readers will find support for all sides and complicate notions of all sides because you're presenting so many various threads in this book. My last question is how did your own views of your family and of your birth country shifted as you wrote this book. ...To be able to engage with the lives of so many women who came before me, what they went done, and sometimes the very similar struggles that they participated in, gives me a sense of confidence. Some of the stories I knew, others I hadn't known at all. I think [this book] allowed it all to come together in a certain way. The other of course was just the question, I perhaps started the project with very specific views regarding who could done more, who didn't do enough, and I ended the book with a realization that we all try to do the best that we can. What I can see in retrospect is not always what's available in the moment. When you have to make that decision, for instance, when my aunt had to decide, okay, am I going to leave my husband because he's taking a second wife, or am I going to go back? She didn't have the perspective of 20 years later. I think that's where I ended up at the end and where I hope readers end up at the end, is with this more reflective understanding of how we live our lives, and the fact that whatever rules we choose to live by, the lives that exist parallel to those rules are, by definition, imperfect. Our emotional landscapes are as crucial to the lives we live as our political and spiritual landscapes.